Mari. Her life was a small happy bubble until it’s popped by the finding out that her boyfriend has been cheating on her — just as the cruise ship she’s on starts to sink! 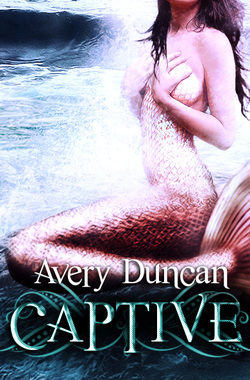 She’s sure that death is near until she drowns upon an underwater cave…and a hulking man with swirling eyes. Seeing a chance to escape, Ambrose forces the terrified Mari to help them both, but not before ultimately changing her life…and her legs. Their worlds turning upside in the matter of minutes, Ambrose is on a mission to clear his name and Mari’s on a mission to return to land. But how can she do that when she slowly starts to fall for the dangerous, damaged man who only wants to be free…and heal her own heart in the process?